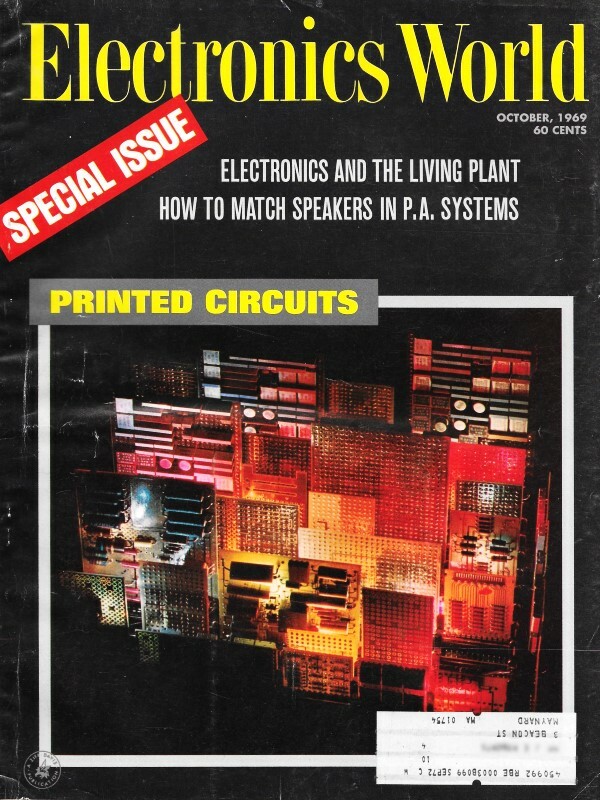 This is another of a series of articles on printed circuit boards (PCBs) that appeared in the October 1969 issue of Electronics World, reporting on the latest and greatest advances in printed circuit board technology. Already in production were rigid multi-layer laminates, flexible plastic laminates, and special-purpose laminates for hazardous duty applications. 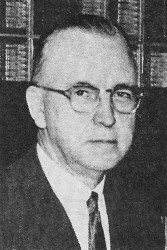 Author Norman Skow does not mention how many layers were routinely accomplished at the time. 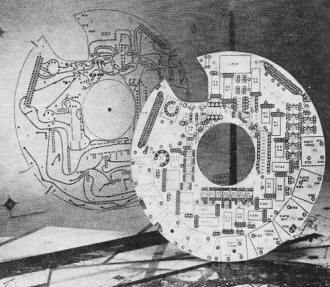 Plated-through holes were a relatively recent thing for high volume manufacturing. Of course population of PCB components was still a completely manual procedure since pick-and-place machines were still a couple decades away. I remember sitting in classes in the mid 1980s at Westinghouse Electric in Baltimore where engineers described their research with machine vision and robotics for inserting both leaded and surface mount components on PC boards for manufacturing. Nowadays you can build systems with greater capacity using LEGO MindStorms and Arduino Makeblock kits. The laminate, the base material on which PC board components are mounted, must have the proper electrical and mechanical characteristics. Here is what is available, along with guidance in making the proper selection. 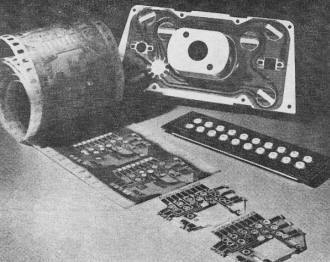 For the processor seeking high production yields of assembled printed-circuit boards, for the circuit designer requiring good electrical and mechanical qualities, and for the ultimate user looking for high reliability and good performance, the quality of the metal-clad laminate used for the printed-circuit board is an important item. To get high yield, it is important to use copper-clad laminates that are free from pits and dents and which are readily sheared, punched, or sawed. If the laminate is free from defects like these, it will help to eliminate open circuits and high resistance points, two faults which decrease printed-circuit board reliability. Production of high-quality circuits can be achieved by photoengraving, silkscreening, or offset printing if the boards are flat and the copper clean. In addition, the board must be adequately bonded not only between the layers of laminate but also between the laminate and the metal. This bonding is important if deterioration of the board or separation of the board from its circuitry is to be avoided. The laminate must be able to offer sufficient resistance to acid, alkali, and solvent attack during the fabrication and processing. The need for sufficient bonding of metal to laminate board is even more critical where fine-wire circuitry or wiring must be produced. In addition, the board must have heat resistance to stand up to the temperature of the solder bath without deterioration. This must be true for boards that have been stored for long periods of time, as well as for those which are new. To meet these requirements, the correct resin binder must be used, it must properly impregnate the right reinforcement material, and from that point on the laminate must be given "white-glove" handling in atmosphere-controlled clean rooms. Final inspection and shipment must be under equally controlled conditions. Top and bottom of a printed circuit on a nickel-clad glass-epoxy laminate shows fine-line circuitry that can be etched. Of the cladding metals available, the only ones used to any great extent are copper, aluminum, and nickel, and of these copper accounts for more than 99% of boards manufactured. Aluminum is readily available in film form and adheres well to laminates, but is handicapped by relatively poor soldering efficiency. Electrolytically deposited nickel is also available and has several advantages, such as scratch resistance, tarnish resistance, and weldability. But higher costs of nickel over copper and aluminum represent a major disadvantage. Copper of printed-circuit quality is used in large quantities because of ready availability and because the metal can be made to have uniform thickness and density, and is free from pits, pinholes, and scratches. Copper for printed-circuit boards can be manufactured with one surface that is readily solderable and the other treated to produce consistently good bonds to the laminate. In order to select the proper laminate, the end user needs to know the properties of the grades that are available. Of the 80 grades of laminates, less than a dozen are used in printed-circuit board applications. Laminates are made in three different classifications: rigid board, ultra-thin panels for multilayer board, and flexible films for flat cables and flexible printed circuitry. The materials that are commonly used to manufacture these types are shown in Table 1. Table 1 - Materials commonly used to manufacture PC laminates. 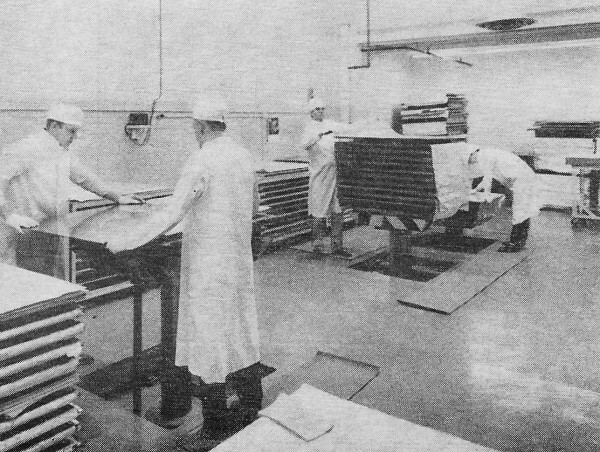 Various resins (shown horizontal) are used to impregnate a number of different reinforcement materials (shown at the left of table). 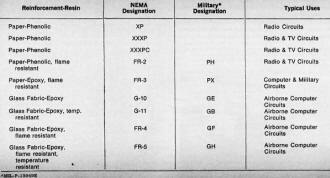 Table 2 - NEMA and military grade designations of laminates, along with some of their typical applications. Printed-circuit rigid boards of paper-phenolic construction have various trade names and are designated by the National Electrical Manufacturers Association (NEMA) and the American Society of Testing Materials (ASTM) as grades XP, XXXP, XXXPC, and FR-2. These grades are relatively inexpensive and can be used in such commercial applications as radio and television receivers where a flat, strong board is needed. These grades are relatively warp-free and have good impact strength, high adhesion, and excellent insulation resistance, in addition to good dimensional stability. Glass mat polyester type board also finds limited use in commercial markets. Flexible printed-circuit film offers advantages of lower cost, less space, and smaller volume. High flexibility of pliable film permits creasing without breaking circuit. The glass-epoxy and glass-polytetrafluoroethylene laminates maintain excellent electronic properties even under severe humidity environments. They are therefore designated for more sophisticated applications in computers, military electronic devices, and communications equipment or any electronic device requiring the highest reliability even under extreme temperatures and humidities. While rigid boards are made from these few materials, they are manufactured in various grades. 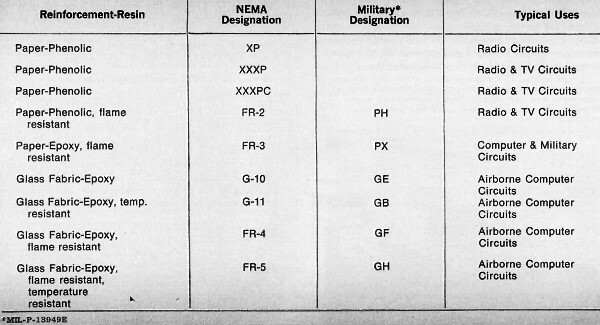 These grades are shown in Table 2, which indicates both NEMA and military grade designations. The thickness of rigid board is from 1/32" to 1/8". In order to increase the circuit concentration in a small space. designers have gone to smaller and multilayer boards necessitating the manufacture of ultra-thin laminates. These thin laminates may vary in thickness from 0.002" to 0.031" (1/32"). The two laminates generally used in making multilayer boards are NEMA grades G-10 and FR-4, which are designated GE and GF by the military. Multilayer board measuring 0.07-in thick consists of five layers of ultra-thin glass-epoxy copper-clad laminate. Four of the layers have copper on both sides, the fifth has copper on one side. The registration of each layer is held to within 0.003 in of the first layer. Over 800 plated-through holes are used, ranging from 0.028 to 0.144 in in diameter. Flexible printed circuitry offers advantages of lower cost, lighter weight, and smaller space and volume without loss of reliability. One added advantage of flexible printed wiring is the fact that its manufacture poses no particularly difficult production problems. Atmospherically controlled white-room conditions help keep PC laminates free from defects. Here pre-pregnated materials and copper for cladding are stored and weighed out. Flexible printed-circuit laminates are flat, pliable, copper-clad films manufactured from high-temperature thermoset adhesive and a flexible plastic film substrate. Among the films used in this type of laminate are polyamide, fluorinated ethylene propylene (FEP), polyvinylidene fluoride (PVF), polyethylene terephthalene, polyimide, polyvinyl chloride, flexible epoxy glass, and tetrafluoroethylene. The basic difference between rigid and flexible wiring is in the base material to which the copper foil conductors are bonded. In rigid board it is stiff laminated plastic, in flexible wiring it is a pliable plastic film. The films possess excellent dimensional stability and resistance to soldering temperatures. The basic properties of a flexible laminate film coupled with the thermoset adhesive permit circuit fabrication with extreme ease due to the high chemical and heat resistivity of the copper-clad film. 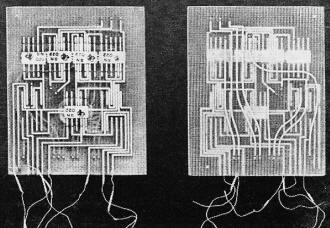 It is also possible to use high pressures in multilayer circuit production without circuit rupture. The extreme flexibility of this laminate, available with copper cladding on one or both sides, permits 180° creases in any direction without cracking, rupturing, or separating the foil from the dielectric film. Printed-circuit laminates are available in standard sizes and thicknesses. Rigid circuit board comes in 36" by 36", 36" by 72". and 24" by 96" sizes. Some grades are available in 36" by 42" and 36" by 48" sizes. Some grades may be supplied in 24" widths and in lengths longer than 96". Standard rigid board thickness ranges from 1/32" to 1/8". Copper foil varies in thickness from 0.0014" to 0.007" and is bonded to one or both sides of the board. Ultra-thin laminates for use in multilayer boards come in thicknesses ranging from 0.002" to 0.031". The same copper thicknesses are used here as on rigid board. and the copper can be bonded to either one or two sides. Ultra-thin laminates are produced in standard sheet sizes of 36" by 36" and 36" by 48". Some PC-laminate manufacturers will cut panels to size. Flexible copper-clad film laminates are manufactured in maximum roll widths of 59" and maximum roll diameters of 14" (2000 feet) . Flexible film measures from 1.5 to 9.9 mils thick with copper on one side, and from 2.5 through 14.8 mils with copper on two sides. In addition to copper, other metals can be used in metal-clad laminate construction, among these are steel, Nichrome, Kovar, and nickel. The cost of printed-circuit laminates depends on the type laminate selected. Further variation in costs results from the different materials from which the laminate is manufactured. In general. the more sophisticated and critical the application, the higher the cost of the laminate. Printed-circuit laminates were developed and used successfully for the first time about 15 years ago. The first efforts were to develop the proper mechanical and electrical properties and adequate peel strength of the copper during soldering. These problems were solved in the early years. 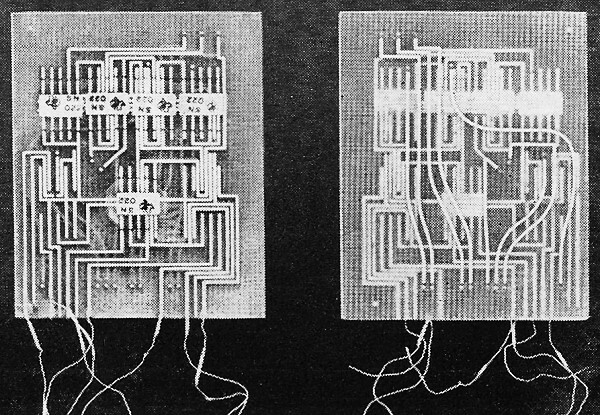 But more recently attention was directed to improving copper-clad material in the face of today's trend toward miniaturized electronic circuitry. Meeting these more exacting requirements has created a demand for laminates with greater dimensional stability and stronger resistance to processing techniques. Great strides have been made in these directions so far and more will be made in the future. * He is a member of Sigma Xi and active in the ACS, SPE, A.I.Ch.E, ASTM, NEMA, and IPC. He is active in the American delegation of ISO (International Standards Organization), and has made many trips abroad in the interests of this group. He holds several patents. Articles he has authored have appeared in twenty-six publications.